← Yet more chickens! / Yummy naughty recipe alert! At the beginning of the week I started to read Little Beach Street Bakery. I’d read The Ghost Hunters and May we be Forgiven and just fancied a really fluffy read. Four chapters in and I was itching to bake some bread from scratch: kneading, proving, knocking back – the whole caboodle. 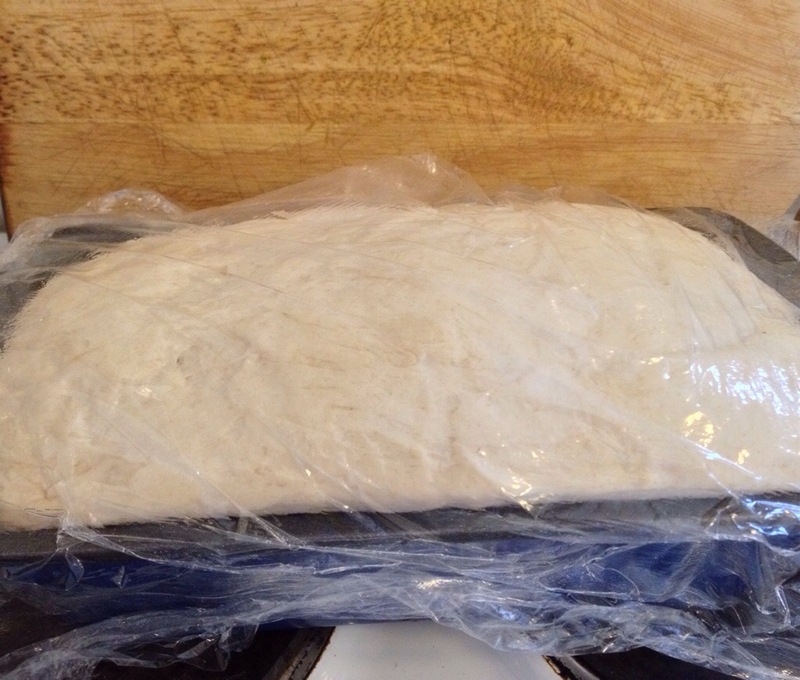 The artisan bread is no effort and all very well but I don’t always plan to make bread ahead. The artisan bread is better left overnight I’ve found, so I haven’t made it as often as I expected. I grabbed a handful of my many recipe books to compare quantities and decided to use Jamie Oliver’s basic white bread dough from The Naked Chef. This was his very first book, published in 1999, he looks so young on the cover (lots of cheap copies to be had on Ebay I see.) I’ve had it years and never tried the bread recipe. 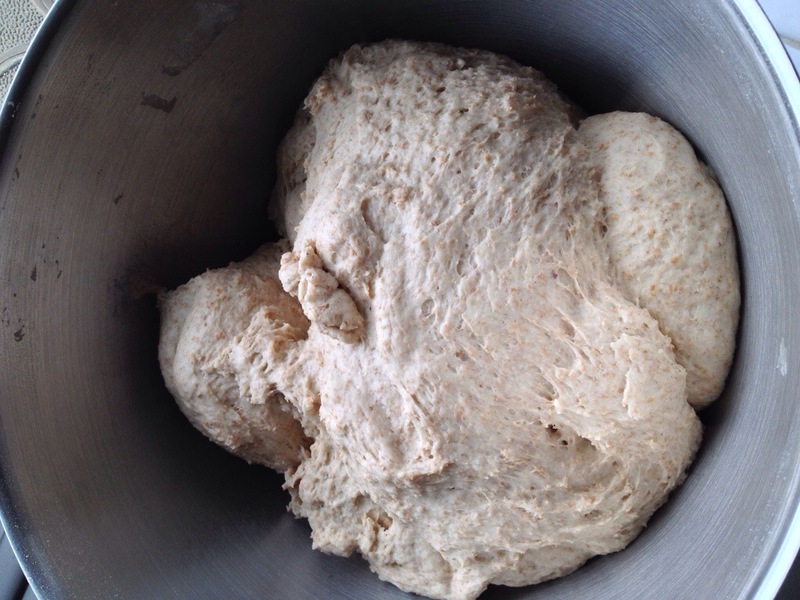 The great thing is that he gives all sorts of variations to make with the basic dough. I decided on two…. 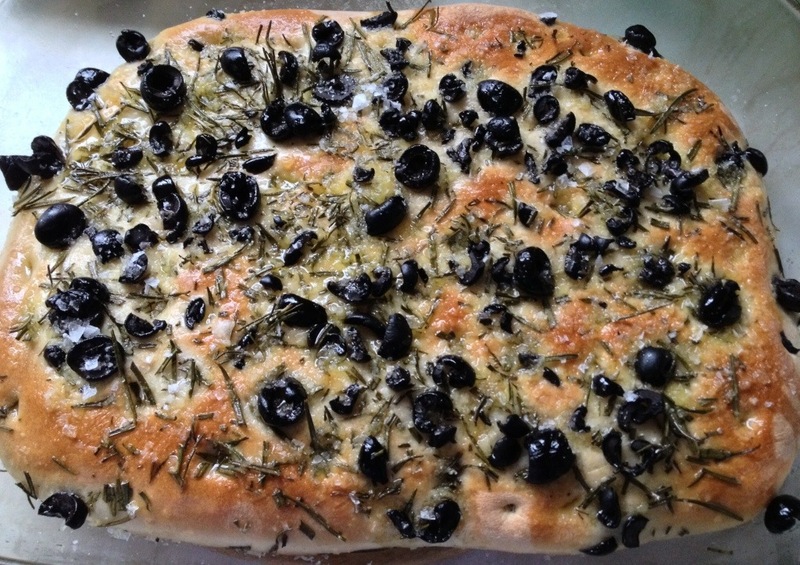 A 2lb white loaf and an olive and rosemary focaccia. I don’t know what happened to the end, my shaping obviously needs some refining. The loaf rose SO much that it touched the shelf above; that’s why it has a dark patch in the middle! The bread is so light and tasty. 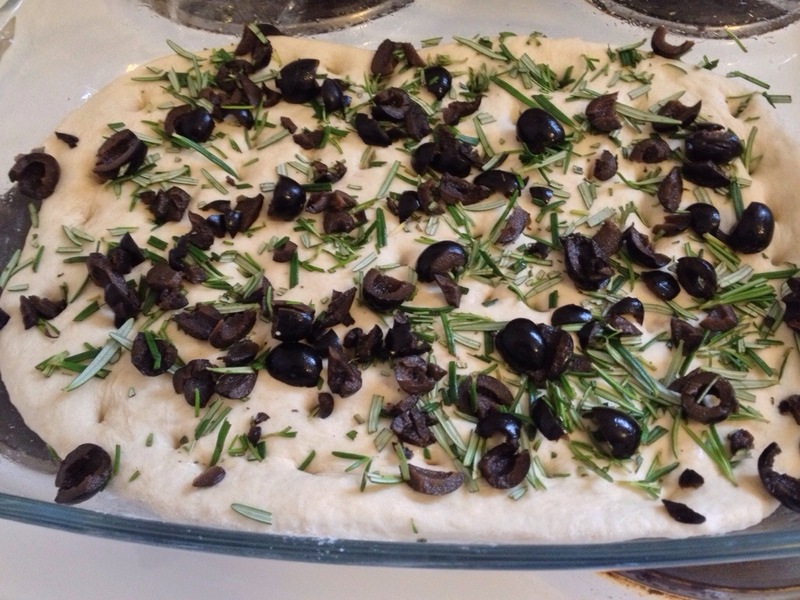 I cut down the salt to 2tsp overall for 1kg of flour as think the stated amount of 30g is crazy, especially when you’re adding salt to the focaccia top along with a good lug of olive oil. 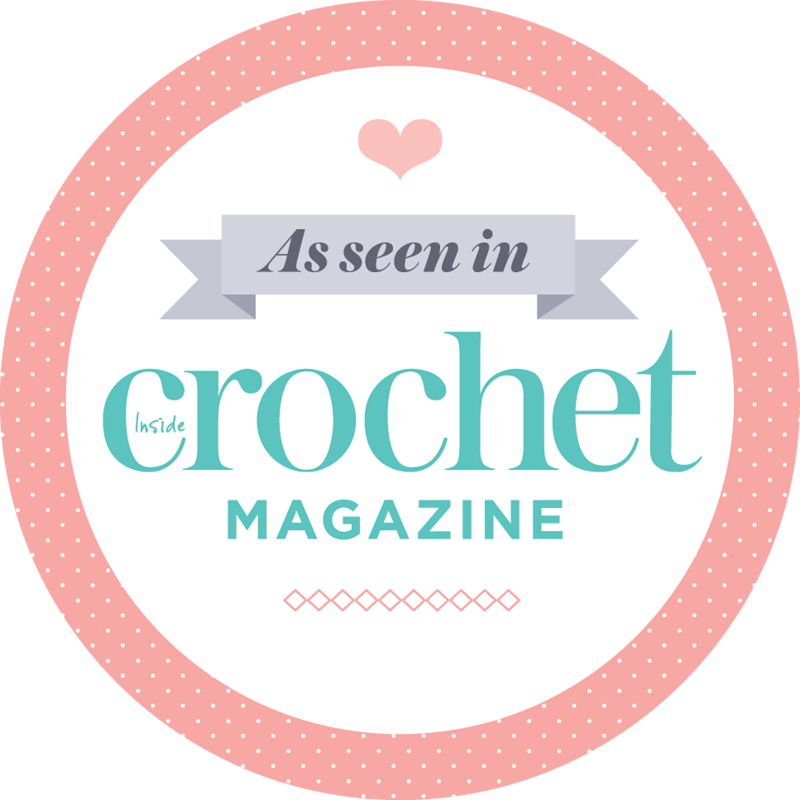 I had to take some crochet books back to the library on Thursday and dived into the cookery section grabbing these two. 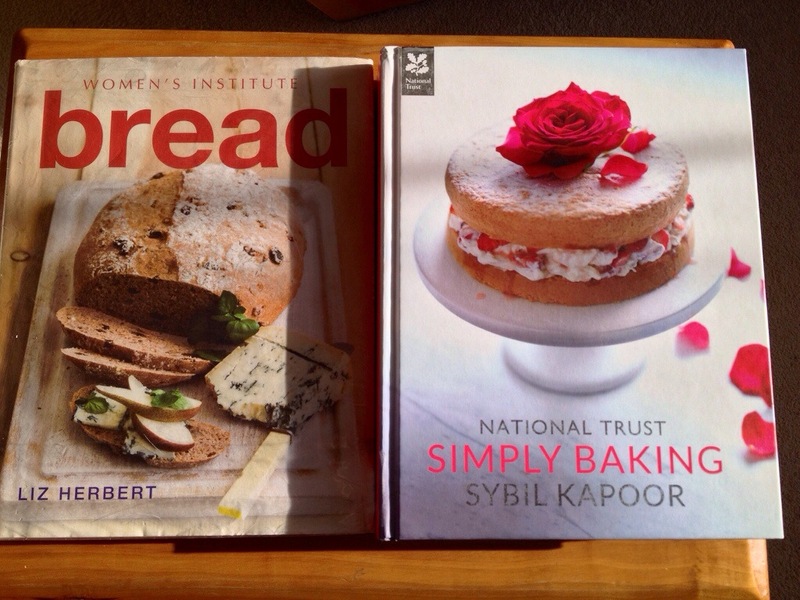 The WI Bread book looks great, it’s packed with recipes. More dough, but I didn’t have enough strong white bread flour and also ran short of plain flour so used some wholemeal too. It was probably 300g out of the 1kg total. I added slightly more water too. I’ve always got SR, plain, strong white and wholemeal but by the end of this week I’d run out of all apart from a sprinkling of SR! I’d made an Hawaiian macadamia cake for Easter Monday teatime and also Herman the German Friendship cake. A neighbour brought some Herman batter to us a few weeks ago in return for a trout. We’ve since passed on batches of the dough and today three family homes are scented with the delicious smell of baking. I’ve had messages and pictures to say how yummy the cake is. If you haven’t made a Herman – do, it’s worth all the stirring. The original cake recipe with apple, raisin, walnuts and cinnamon is the most delicious treat, especially eaten warm from the oven. Tonight I found that there’s a website so you can make your own starter and spread a bit of Herman to friends and family too. There are different variations too. 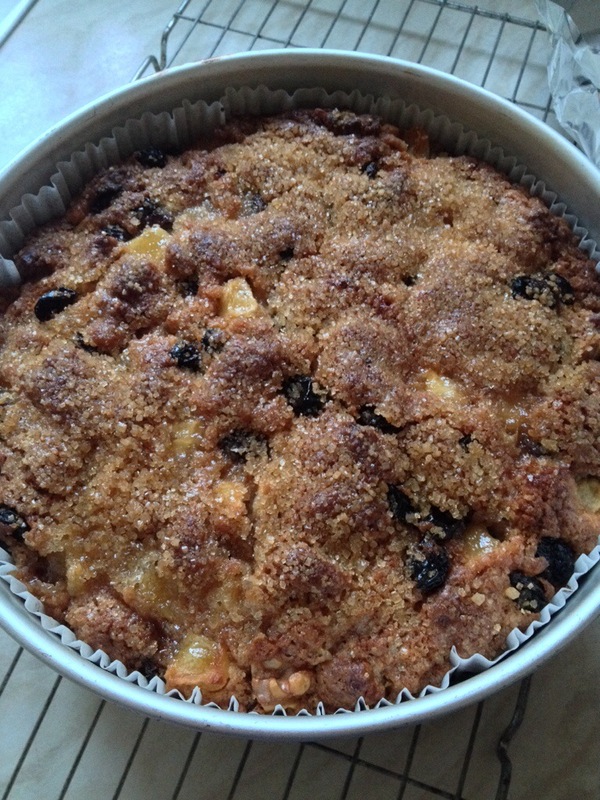 Herman the German Friendship cake. The cake batter has melted butter and a good sprinkling of demerara on the top which makes for a wonderful crunchy topping. 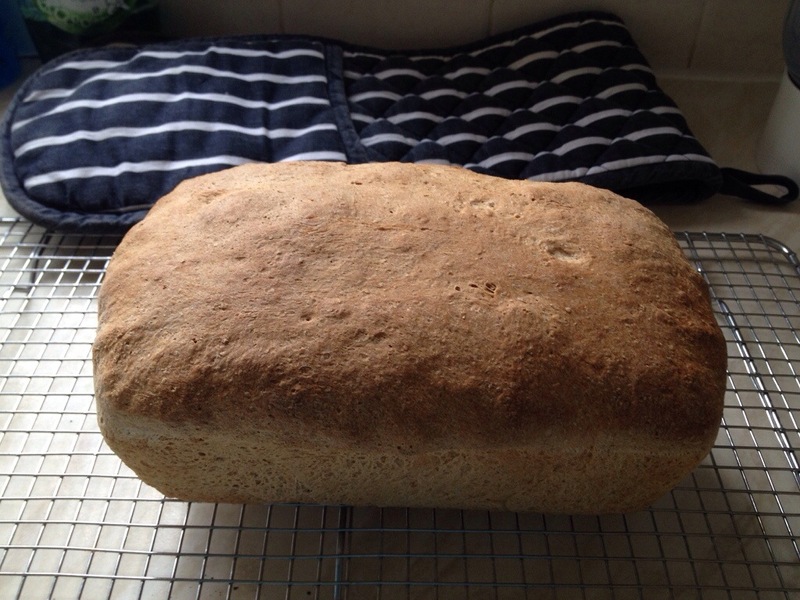 My final shaping again needs work, it’s ages since I made bread from scratch, but it’s meant to look rustic huh? The rolls were delicious, it’s a great basic dough recipe. I had aimed for mini loaf shapes but will just go for the classic round next time! I’ve shared some of the different breads with family. 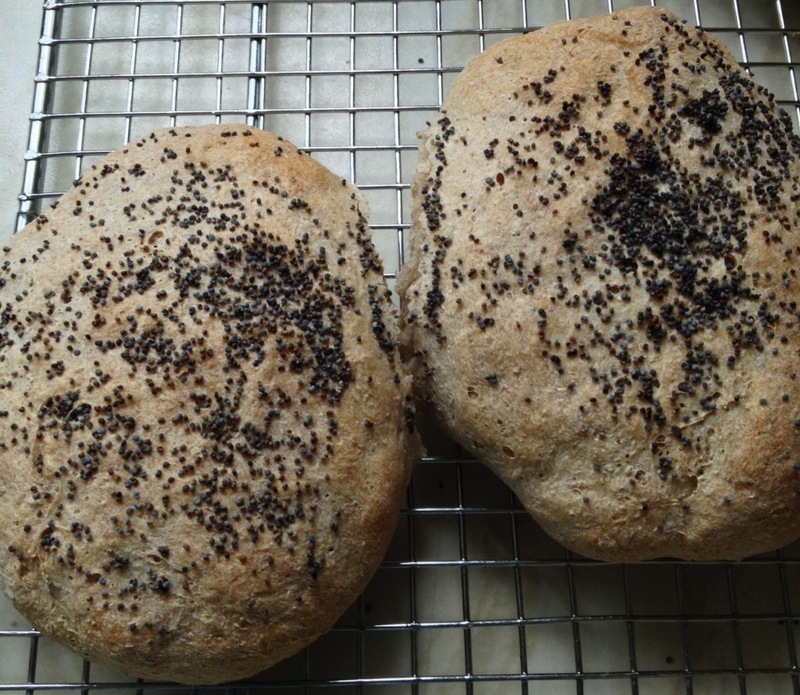 I’m going to top some with sunflower seeds and others with poppy seeds again next time. I’ve written down some different glazes to try from one of Mum’s bread books too. A friend was meant to be coming on Saturday but sadly she came down with a horrible lurgy, poor thing. 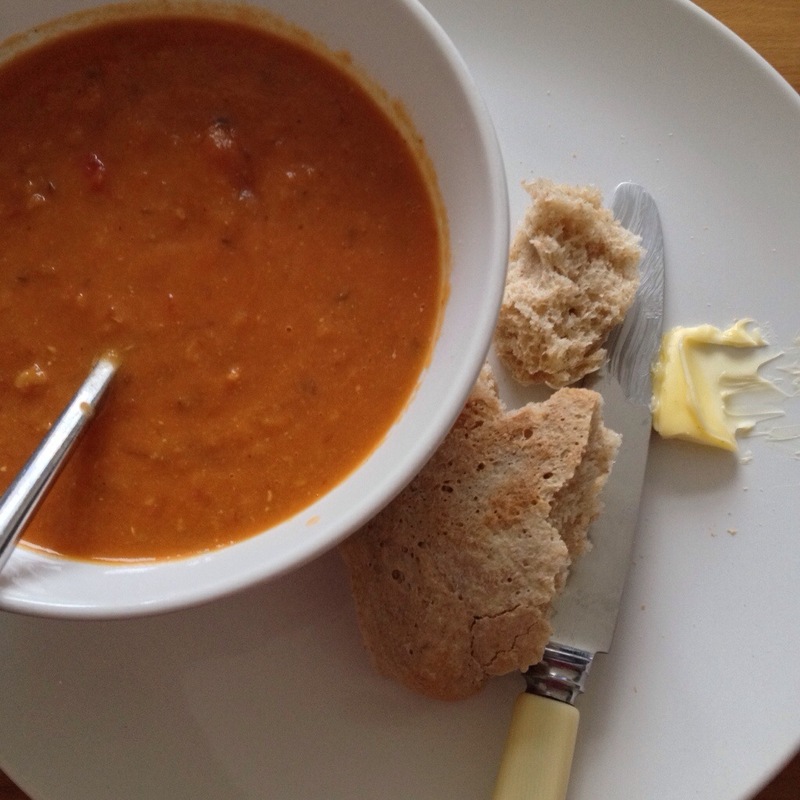 Chatting with her about the necessity of soup when you’re ill made me realise how much I craved some; so I made a quick batch of lentil and tomato. 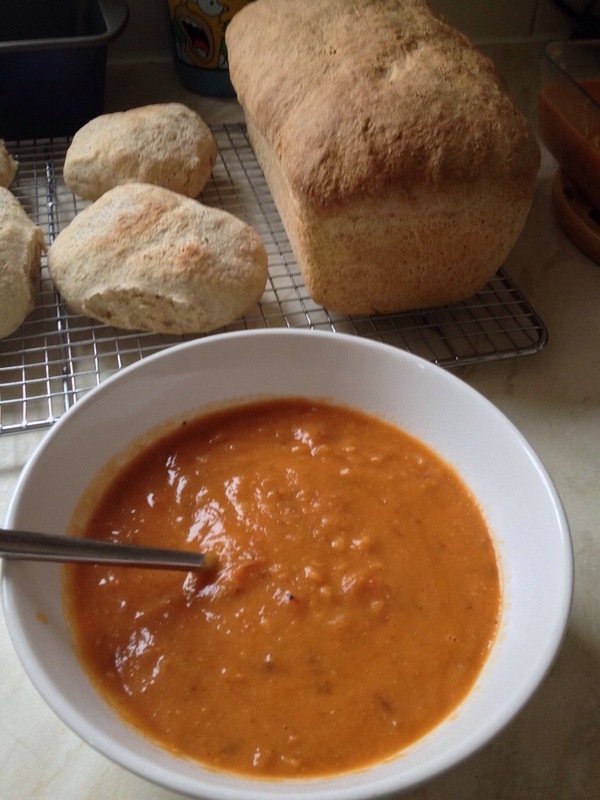 Homemade soup with a fresh warm roll…..mmmm. There really is nothing like homemade bread: the taste, the smell, the process of making the dough is so relaxing and very therapeutic. I’m going to carry on making bread regularly. 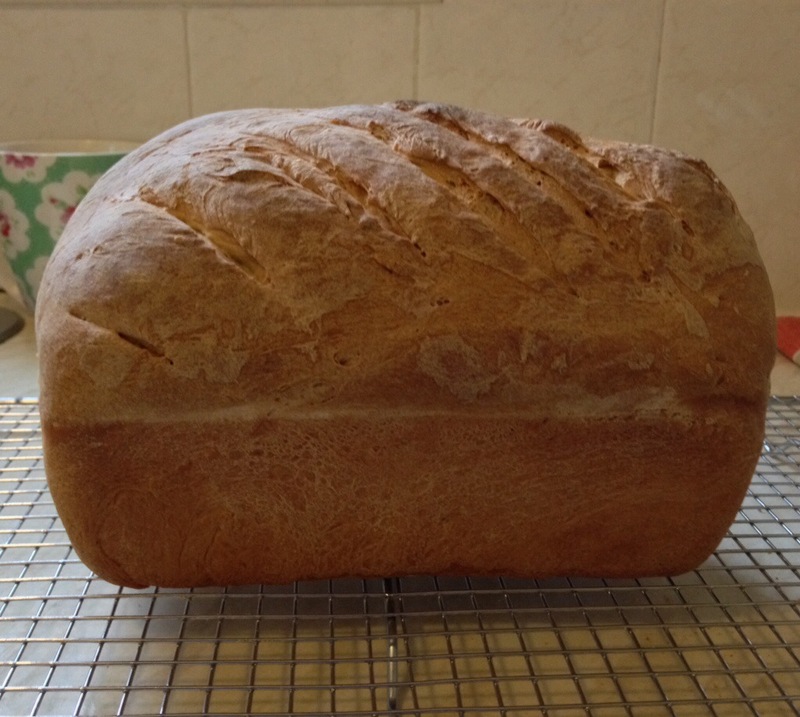 Although we buy good loaves from the local shop, homemade is definitely tastier. I was lucky enough to grow up on homemade bread and cakes, homegrown fruit and vegetables. You really can’t beat it, but at the time I could never understand people getting excited about apple crumple, pie, rhubarb fool or gooseberry whatever, to me it was ordinary everyday fare. It wasn’t until I was older that I appreciated how well fed we were. I had a strong indication that my dough obsession was being encouraged when I was given this little lot (and 2 boxes of yeast) today! Apparently the checkout woman’s eyebrows were all the way up to her fringe as she heaved the bags across the scanner. When she asked if Someone was planning on doing lots of baking he told her we have a lot of wallpaper that needs putting up. Ha ha..groan….. The pantry shelf is full: plain, self raising, Doves Farm Rye, Doves Farm Malthouse, Doves Farm Strong White and their Wholemeal too. Woo hoo! I’m planning on making a Malthouse loaf (recipe on the bag) next week. Wow all your breads look amazing – makes me feel hungry. Thanks Jean. The smell makes it tricky to wait to eat a little while it cools down! Having made my Artisan Bread again today I am inspired to try a few flavours. Might give Herman a go too. One of my colleagues at school makes soup for us all on a Friday. I might treat everyone to homemade bread to go with it. Herman is great, such a fun thing to do and pass on to friends & family too. Thank you Mrs A! 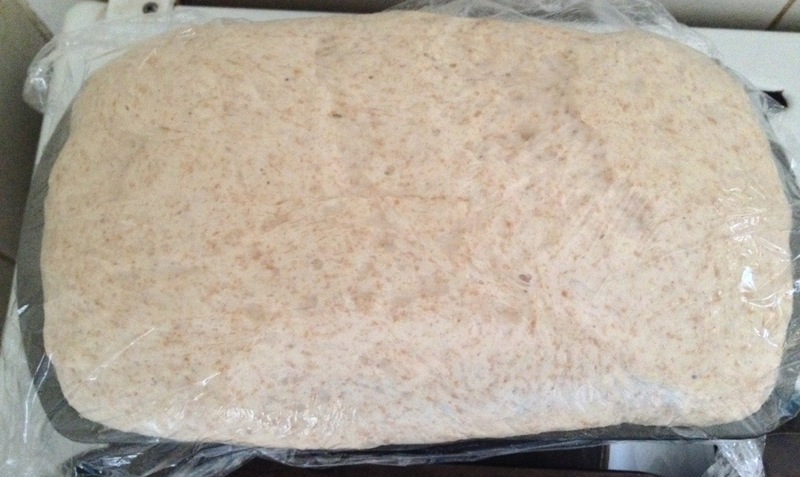 I’m researching the best sourdough starter to make at the moment. I’m with the experts who say you should eat a balanced diet which includes all food groups including carbohydrates.